Entertainment and Team Building in the Land of Enchantment! The community is very religious and has an artistic sense that we like to tap into. While not really a military town, there are many bases within driving range and events are held for military groups and their families. 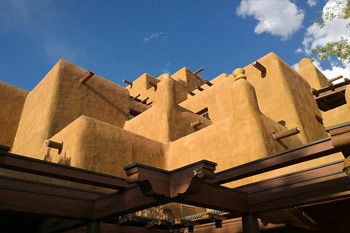 A lot of the buidings are built out of adobe. It is natural and easy to produce and yet wouldn't survive in other parts of the country. So, too, the comedy has to be built for the area as well. Destination Team Building serves the entire Santa Fe area and would gladly put together a program for your group anywhere. 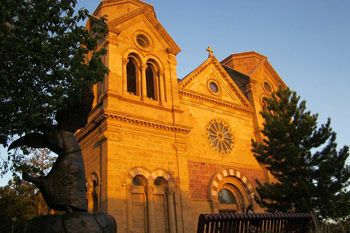 Santa Fe is known for its Southwestern style and artistic lifestyle. The people are charitable and they have a sort of formal informality about them. 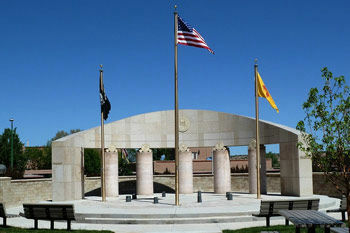 And all of this in the New Mexico state capital. The natural beauty surrounding the city can not be overstated. There are plenty of outdoor activities to keep people active, from hiking and sports to kite flying to simply enjoying a fun evening. The area is a relaxing backdrop and the thoughts of a more active urban environment are left far behind.